Godiva – Saint or Goddess? How old is the legend of Lady Godiva? A thousand years, or more? Was she a real life woman, or does her story reach back even further in time? Let’s follow the golden thread and find out. Lady Godiva has a secret past. There was a real, philanthropic woman called Countess Godgyfu who founded the monastery on which the first cathedral of Coventry was built. She gave valuable gifts to the city, including bequeathing a silver necklace, which was believed to once adorn the neck of the Cathedral’s statue of the Virgin Mary. Further back in history, Godiva’s legend was linked to saints and goddesses. In their book Virtuous Magic: Women Saints and their Meanings, authors Sara Maitland and Wendy Mumford include Godiva of Coventry. Godiva’s story, like that of many saints, includes elements of folk story, local tradition and memory of her exceptional goodness and philanthropy and had similarities to stories of many saints from the same or earlier periods. 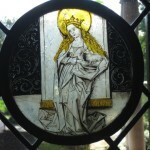 In particular, Godiva’s legend has been linked to the earlier tale of St Agnes, the third century virgin martyr. In The Golden Legend complied by Jacobus de Voragine in the 13th century, the beautiful Agnes was forced to walk naked through the town as a punishment for refusing to give up her faith. Agnes’s hair miraculously grew long enough to cover her, and such a bright angelic light surrounded her that no man could see her. 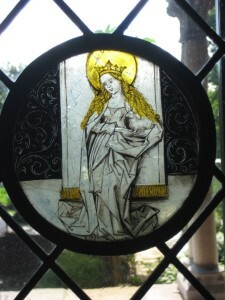 The story of St Agnes and Godiva are clearly of the same family: the long (golden) hair and the piety that overcame debauchment and even being seen – just as in the folk tale the townsfolk of Coventry could not/would not see their liege lady (except for peeping Tom). Let’s go back even further in time. Godiva’s tale is connected to Greek and Celtic myths and sacred, semi-clad female processions. The Teutonic goddess Hertha made a procession through the woods after her ritual bath, while in Greek legend it was at a man’s peril to witness the woodland bathing of the goddess of the hunt, Diana. Godiva’s ride may well have descended from one of these parades. In another version, Godiva’s ride is not a procession, but a love-chase. In this story, Leofric sets his wife a riddle to test her. She must come to him neither being clothed or unclothed, without a foot touching the ground. Cleverly, Godiva rides rather than walks and covers her naked body with a golden net of her hair. In some tellings of this love chase, Godiva is accompanied by a hare – connecting her to the Celtic goddess of Spring, Eostre. She has also been connected to another spring goddess who took a May-Day procession to summon the new season. Her name? The goddess Goda. Like many pagan myths, such stories were absorbed into Christianity. It was in the Middle Ages that Goda’s tale became connected with the real and genuinely philanthropic Countess Godgyfu and the old pagan love-chase became a Christian procession celebrating her piety. Godiva’s story has come down to us through the ages in a mix of fact, folk-lore and legend. Some call her a goddess, some call her a saint. All we know for certain is that Godiva’s extraordinary story continues to catch us in the net of her long, golden hair.